Industrial buyers have been some of the earliest adopters of Internet of Things technologies – looking to translate big investments into big wins that secure their organisations clear competitive advantage. Indeed, a recent paper by CapGemini shows that enterprise level adoption is likely to be fastest in contexts where use cases enable the most rapid ROI. It is, perhaps, little wonder that companies implementing enterprise projects combining major investments that marry operational technology with information technology are seeking fast payoffs. But for many organisations, the ability to establish a clear business case for Internet of Things projects – one that demonstrates clear financial benefits within tightly defined timeframes – can prove difficult and potentially provides a blocker to getting such projects off the ground. Part of the problem appears to be that in attempting to prove ROI from IoT, many organisations look to cost reduction as the quick win and low hanging fruit. But whilst this may be a contributor to the business case for IoT funding, it is only part of the story. Smart monitoring of devices certainly does enable lower operating costs by reducing machine failure, eradicating safety issues and enabling greater time and materials efficiencies. 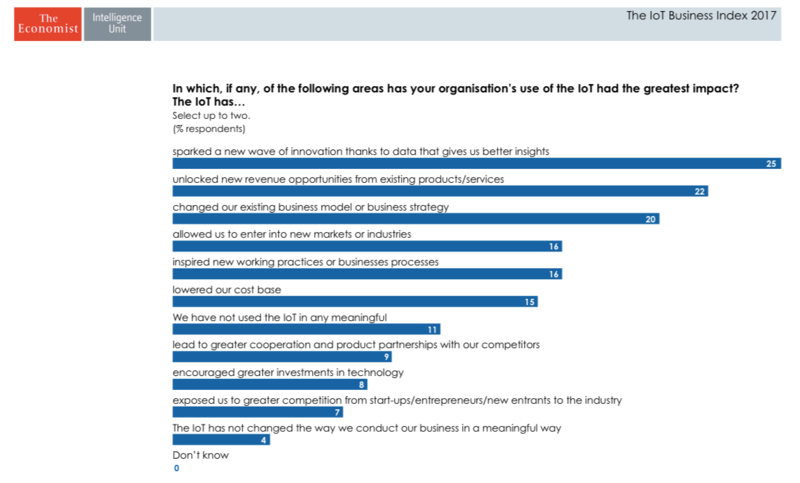 But the companies that are getting the most out of enterprise IoT implementations appear to be those who are taking a broader view. In a recent (2017) study, the Economist Intelligence Unit surveyed 825 business leaders. It showed that 20% reported already seeing the Internet of Things making a transformational impact in their industry, with a further 30% expecting to see significant impacts in the near future. One in four reported IoT sparking a new wave of innovation within their organisations – thanks to the improved flow of data enabling the generation of insights. 22% reported IoT funding as unlocking new revenue opportunities and 16% suggested that IoT had allowed them to enter new markets and industries – whilst only 15% reported lower costs as a direct result. So, it would appear that companies who are looking beyond cost and embracing the potential of IoT to transform their business models, generate greater revenue and use IoT as the catalyst to spark more innovation within their organisations are experiencing the greatest positive impact from their IoT investments. What are the core business problems we are looking to solve? What are our targets for cutting costs, growing revenue or shifting the business model? 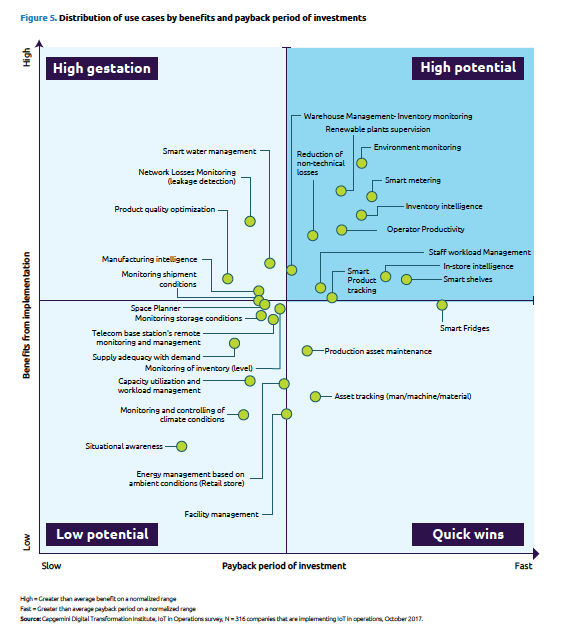 Are we clear on the value gains likely to result from our IoT investments? Those reporting the most dramatic IoT successes were also able to demonstrate strong IoT leadership, gaining the commitment and focus of others to create a sense of urgency to fast-track adoption. They had teams that combined both business and technology acumen to help the organisation make the step-changes in performance that IoT requires. And finally – whilst being open to the broadest possible opportunities from their IoT projects - they focused implementation on a tightly defined group of use cases that would prove the potential for impact. Inevitably, organisations that approach IoT projects with this kind of mindset, furnish themselves with proof of ROI, smoothing the path to wide-scale adoption and roll out. As an early stage investor in IoT companies, it is our ambition to promote early and successful uptake of IoT technologies. For us, the clarity of the use case defined by an IoT developer is absolutely critical in our decision whether to invest in the company. We are choosing only to support products and services that squarely address the most persistent problems faced by modern industry. Our portfolio currently comprises 20 IoT innovators, with a number focused on supporting the goals of industrial companies, including Senseye, Tag Sensors and Metron delivering monitoring solutions, cold-chain logistics solutions and energy management for industry, respectively.